Last year, six out of the 10 most visited countries in the world were in Europe, according to data from the United Nations World Tourism Organization (UNWTO). France topped the list with 87 million international arrivals, while Spain, Italy, the United Kingdom, Turkey, and Germany followed closely behind. 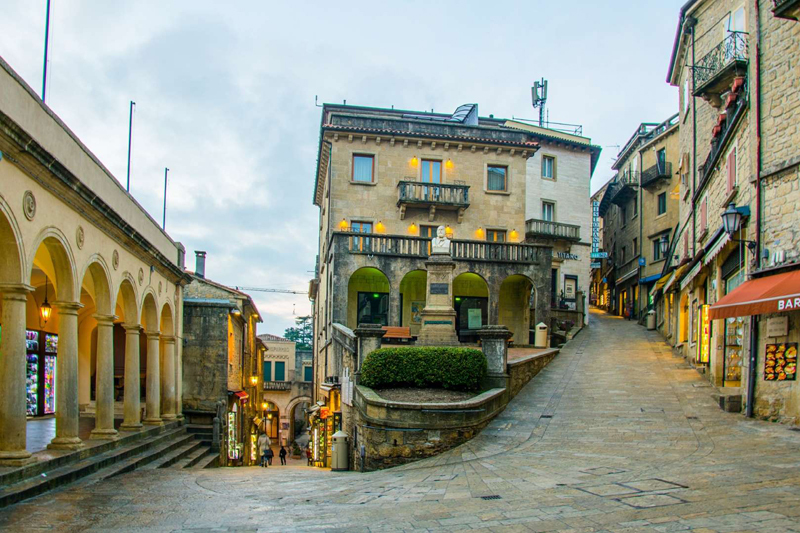 In comparison, San Marino, a sovereign microstate located in the mountains in the middle of Italy, welcomed just 78,000 foreign visitors in 2017. However, considering that number jumped from 60,000 in just one year—more than a 31 percent increase—it is officially the fastest growing destination in Europe at the moment. Curious to visit? Here’s what you need to know about this tiny country before you go. At just under 24 square miles, San Marino is just a third the size of Washington, D.C., making it larger than Vatican City and Monaco, but smaller than Europe’s other microstates Liechtenstein, Malta, and Andorra. Local tradition says that Saint Marinus, a Christian stonemason, founded the Republic of San Marino (the country’s official name) in 301 C.E. when he arrived on Mount Titano and lived as a hermit. His feast day—September 3—is celebrated as the national holiday. Even when the rest of Italy’s city-states unified, it remained independent. Today, San Marino is currently run by a parliamentary republic, with its own executive, legislative, and judicial branches that operate separately from Italy’s government. 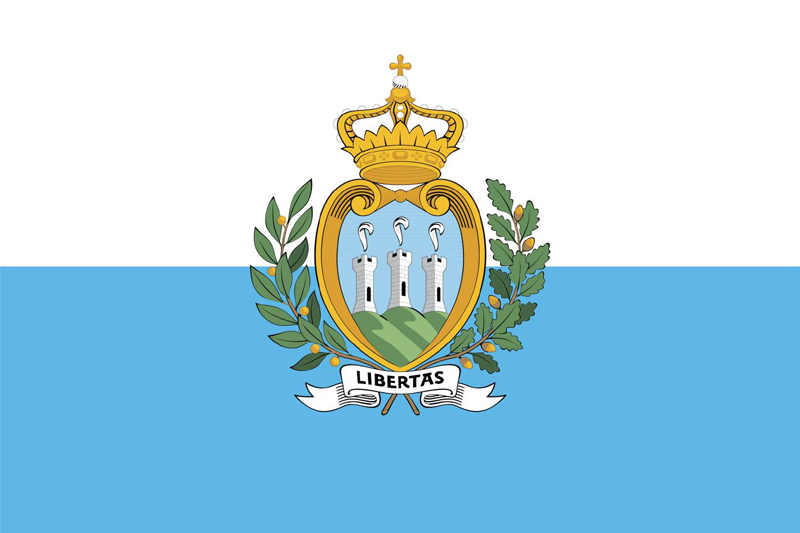 Even though San Marino doesn’t have its own language or currency (locals speak Italian and use euros), it does have its own flag. With a white band on top and a light blue band on the bottom, the flag has the national coat of arms at its center, which features three towers on three peaks. The towers represent the castles built on Mount Titano, the country’s highest point. Since San Marino doesn’t have an airport or train service, it’s easiest to fly into one of the closest major cities—Florence or Bologna—and drive from there. It’s just a little over 110 miles east of Florence and nearly 90 miles southeast of Bologna, making it an easy day trip from many points in Emilia-Romagna or Tuscany. However, if you’d like to spend the night there, San Marino does have several dozen hotels located throughout the country, most of which are centered in the capital City of San Marino on Mount Titano. 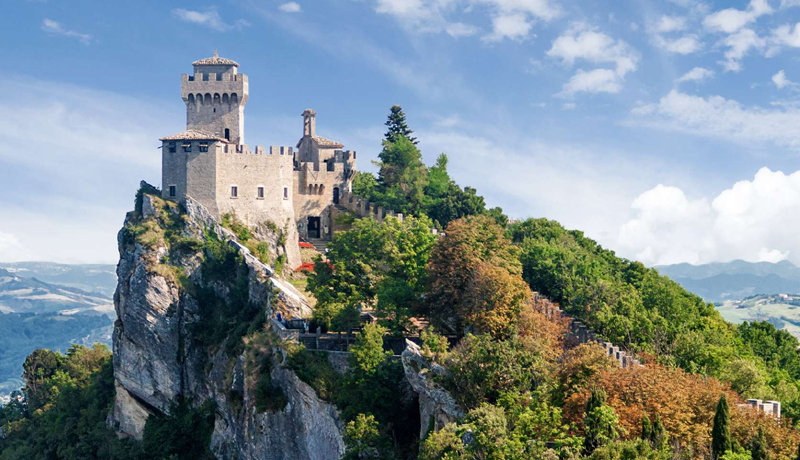 San Marino’s Historic Center and Mount Titano were named aUNESCO World Heritage site in 2008. As the only surviving city-state in Italy, the medieval city center still has its fortification towers and walls, plus a neo-classical basilica, convents from the 14th and 16th centuries, and an 18th-century theater that are still in use today. 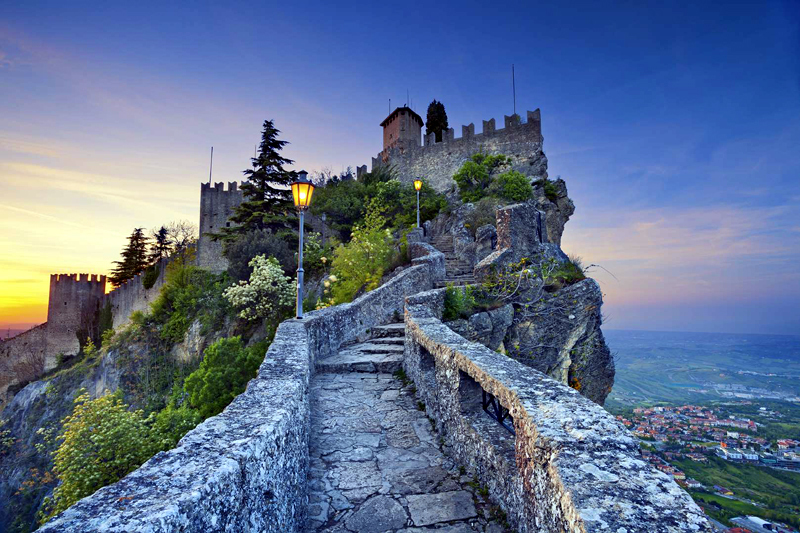 According to a July 2017 estimate from the CIA, San Marino’s population is 33,537, which means that the number of international tourists arriving in the microstate each year more than double the number of locals. You won’t need your passport to enter San Marino from Italy, but if you do want a stamp you can visit the local tourism office and ask for one for €5 to commemorate your visit.